What if Phulmai did not exist. You can meet her in the forest; follow her for a day; listen to what she says and so complete half an assignment. The other half lies in accounting for her, and all those like her who spend their lives headloading. Step out of the forest into, say, a government census report, and Phulmai disappears. You con the sociology of lifestyles, niche or otherwise; the headloader is not a consistent, indentifiable object of knowledge. Mystified, you seek development critiques. Surely there must be some 'archipelago of the informal' as sociologist Serge Latouche calls it, some space interstitial to capitalism or modernity -- to the immense discourse that has unfolded around these dis/connected experiences of being human -- in which a human head loaded with about 25 kgs of renewable energy can rear up to announce its confident presence? But no. Perhaps in recording the authentic culture of poverty that characterises localised ecologies of existence -- sometimes entire societies -- pulled along in the wake of Development (upper-case D intended), the headloader was not considered important enough. She was never considered to be of value. Or was it that the power-play that wilfully contaminates knowledge-production determined that those who merely subsist ought never to find mention? After all, what exactly is it that a headloader does? After spending a day with Phulmai you could actually say: well, she carries wood. Then someone off-loads it off her for a pittance, and profitably sells it for use. Please beware. If you say this, you might be accused of not only being literal but also obsolete. Consider, then, the equally amazing possibility that Phulmai's headload -- the load any headloader carries -- is a completely dubious element in the energy-use system. Fuelwood use has become, for some bizarre reason, an area of energy-use that doesn't excite economists at all. Perhaps they are so busy with the econometrics of globalisation that a headload of fuelwood is an absolute exception. There is a demand for fuelwood; try proving it empirically. Households use fuelwood; try convincing development experts. The fuelwood market is for real. Of course it isn't! a corpulent forest bureaucrat will retort and so shut your mouth. The same corpulent forest bureaucrat will then refuse to let you have a word in, and rant: these headloaders are illegal. They destroy the forest. They are degraders, environmental villains. You will then be amazed, for the third time: had not Phulmai vehemently denied she destroyed forests? Did she not say she was interested only in dead trees and dead branches, in wood that did not have sap in it (as in a freshly broken branch) but was saleable precisely because it was dry? Who's right? Our forester, or Phulmai? Are headloaders engaged in a completely negative activity (destroying forests) or is it a myth they labour under? Is it possible this myth is so persistent, or has so filtered through society, that blaming a headloader is now a matter of common sense? Can it be that such a (common-sensical) perception blocks the production of a positive knowledge that might throw a completely different light on the load of wood a Phulmai carries, indeed on the value of headloaders, and headloading? Sifting through these questions has a purpose. We know Phulmai exists. Fuelwood is very much part of India's energy-use system. The fuelwood market is a billion-dollar one. How is it, then, that a headloader merely subsists? Why must Phulmai exhaust herself to celebrate Diwali? What can be done, so that a headloader doesn't walk in oblivion? The 1981 census grouped headloaders as 'harvesters and gatherers of forest produce' and 'log fellers and woodcutters'. The economic significance of what they did was immaterial. Who they were was even more immaterial; the 1981 census has no data on the headloader population. The 1991 and 2001 census persisted in consigning headloaders to the uncharted economy, not to be bothered about. Headloaders were 'other workers'. In 1998-99, the National Sample Survey Organisation (54th round) classified them as 'self-employed in household enterprises' along with casual farm and daily wage labourers. This was a non-trade category of workers in India. Always already informal, there was no attempt to quantify the numbers engaged in headloading. One study had grappled with this problem. In its Second Citizen's Report on the State of India's Environment (1984-85), the New Delhi-based Centre for Science and Environment estimated that 3-4 million people are engaged in the business of headloading (later updated to 11.8 million). This business was the largest employer in the energy sector! The study's estimate was based on total fuelwood consumed in urban areas, assuming forest departments supplied 50 per cent. So. Does a headloader exist? Now, some studies seem to say what the 2nd Citizen's Report had argued for 17 years ago. Yes, they do. About 70 per cent of them are women, according to different surveys by the Indian Institute of Forest Management (iifm), Bhopal. In (undivided) Madhya Pradesh, headloaders collect nearly 600,000 tonnes of fuelwood every year from forest areas for sale in urban areas (excluding personal uses), according to a survey by Ram Prasad and P Bhattacharya of iifm, Bhopal. In Rajasthan, around 400,000 families collect fuelwood from the state's shrinking forests. So headloaders exist. Immediately there arises a contradiction. They exist, but only as illegal entities. How has this attribution come about? Under the present forest management system, fuelwood collection is allowed only as a 'concession' (personal use). Technically, in the Forest Act (1927), there exists a patch called a 'wood lot' that ought to cater to fuelwood needs. But today most wood lots are highly degraded. Also, people are ignorant of such rights. So the headloader enters the forest to collect fuelwood, pretending it is for her own use. In the process, she renders herself as one who is an 'outlaw'. Then there is the fact of the forest department moving out of fuelwood supply, turning the headloader into the sole conduit for fuelwood from the forest. A burden that further imperils her, once 'concession' and rules are taken into account. Till the mid-1990s, forest departments used to run fuelwood depots. Fuelwood was a byproduct of the forest department's commercial harvesting of forests: branches would form the fuelwood, while the main tree was sold as timber. Then in 1996, the Supreme Court put a ban on tree felling. Government began to shut the depots down. In states where depots still existed, as in Madhya Pradesh, Karnataka and Chattisgarh, surveys indicated that they catered to less than 10 per cent of the total fuelwood consumption. The other 90 per cent now began to be brought on head loads and cycle loads. And the 'concession' stick began to be used. Forest guards today harass headloaders and extort money, Rs 5-10 per headloader. A plethora of lower Panchayat officials levy 'tax' for collecting wood from revenue forests. Add to this the bribe that has to be paid to bus and train conductors, by headloaders carrying wood to urban centres where a sizable population mostly residing in slums still uses fuelwood. The headloader today must pay these informally instituted costs. Thanks to the 1996 Supreme Court order, and a request by the Union ministry of environment and forests (mef) and state forest departments that timber transport be curbed on trains. She must find herself rendered, at every step by diktat, an illegal entity. It isn't enough that a headloader must negotiate, at each stage of her walk, her growing status as an illegal entity. She must also enter a huge, largely redundant, debate on the veracity of merely carrying wood. Is fuelwood really worth it? After all, who uses it anymore? To answer these questions, we must go back to the aftermath of the 1971 oil crisis. The government of India set up a Fuel Policy Committee (fpc) to assess the country's energy scenario. The report, submitted in 1974, noted: "Nearly one-half of the total energy consumed in the country comes from the non-commercial sources such as firewood (including charcoal), cowdung and vegetable waste. The dependence on these fuels is maximum in the domestic sector." Throughout the 1970s, fuelwood was consumed both in urban and rural areas. Then from the middle 1980s onwards, the country began to witness a transition. This was primarily due to a shift, in urban centres, from biomass-based fuels (fuelwood, cowdung) to petroleum-based fuels (kerosene and lpg). The transition must have been a slow one, for it was noticed and analysed in a 1990 paper called Firewood Balance in the Nineties, written by I Natarajan, (then) senior economist at the National Council of Applied Economic Research (ncaer). 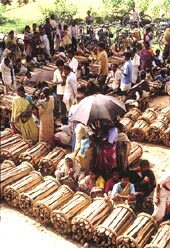 Urban firewood consumption, Nataraj pointed out, had reduced from 16.5 million tonnes in 1978-79 to to 9.5 million tonnes in 1983-84. The 1991 census also seemed to point this way. Out of 151 million households in India in 1991 (39.5 million in urban areas and 111.5 million in rural areas), 39 per cent in urban areas depended on biomass-based fuels (see: Table 1). Both these documents also acknowledged that the energy transition was restricted only to urban centres. Natarajan's paper clearly pointed out rural India still depended heavily on biomass-based fuels. The 1991 Census buttressed this reality: 92 per cent of all household in rural areas in 1991 used fuelwood, cowdung and agricultural residues. Such dependance continued right through the 1990s and research, though meagre and confusing, added a very interesting twist to it. In 1992, an expert group took up a massive study of 39,000 households covering 201 districts. The idea was to prepare a rural energy database for the ministry of non-conventional energy sources. The survey made a distinction between requirement, and consumption, of energy in rural areas. It was, perhaps, the first of its kind to do so. Most energy surveys of rural areas, when taken, usually dealt with requirement (the amount of energy required for an ideal standard of living). Real consumption had never been estimated (it still isn't properly estimated). Breaking new ground in a way, the survey reiterated that fuelwood continued to be the predominant form of energy use in rural areas. The mean per capita consumption for fuelwood (used in cooking) was 1.21 kg/cap/day, while for cowdung and agricultural residue it was 0.41 kg/cap/day and .47 kg/cap/day respectively. Clearly then, a shift had begun to occur in the use of biomass-based fuels in rural areas. People were using less cowdung and agricultural residues. Did this mean they were using more fuelwood? Yes, if a 1995 ncaer study was to be believed. Rural areas were consuming more energy than ever, the study found. The total household energy consumption in 1992-93 was 153.8 million tones of coal replacement. Comparing its findings with its earlier nationwide survey of 1978-79, the ncaer study pegged the average annual growth rate of fuelwood consumption between 1978-79 and 1992-93 at four per cent, up from 78.85 million tonnes to 131.37 million tonnes (up to 61.2 per cent of total rural household energy use in 1992 from 54.57 per cent in 1978-79). Most crucially, the study established that fuelwood would remain the most dominant source in the bio-fuel sector. Though cow dung consumption increased from 66.76 million tonnes in 1978-79 to 86.73 million tonnes in 1992-93, its share fell from 22.51 per cent to 17 per cent. Similarly crop residue consumption also fell from 17.41 per cent to 13.35 per cent. This journey through a very potted history of rural energy use has huge implications for Phulmai, and others like her. The headloader is the sole support to a huge and thriving economy, whose turnover according to the Union ministry of environment and forests is US $16.54 billion. Her trade is deemed illegitimate. Yet it carries on, for the demand is a real one. The headloader is the ultimate supplier; the veracity of her activity simply cannot be doubted. Why, then, is it that she continues to flounder in a sphere of economic activity everyone knows about, but nobody wishes to acknowledge? The answer is so simple it never fails to startle. The claim for the existence of the fuelwood economy, of primary and secondary markets all over the country fed exclusively by headloaders, is completely overlaid by another claim: fuelwood carriers denude the forest landscape. This is, apparently, an environmental claim. So powerful has been its presence as an indubitable truth that it has led to the suppression, and transformation, of a multi-billion dollar market into an informal, underground one. What is the basis of this claim? How well-founded is it? The 1974 fpc report may be taken as the beginning of this claim, or fiction. While noting how India's households depended on fuelwood, it stated: "This has led to a large-scale denudation of forests." This belief has now taken the status of a truth, as exemplified by the conclusion the 1988 forest survey drew. This belief rested on a simple premise. Energy consumption studies always showed a very high order of fuelwood consumption. At the same time, forest departments of the different states that comprise India equally consistently showed very low levels of legal fuelwood production from Indian forests. Where, then, did the remaining fuelwood come from? Experts have always argued that the remaining firewood came illegally from forests. These headloaders have been entering forests and callously denuding them. But there were studies that argued otherwise, such as the 1995 ncaer survey (see: Table 2). Compared to 1978-79, more rural households were using superior biomass. They weren't using twigs and branches so much as they used to; they had moved on to logs. The use of fuelwood in the form of twigs had reduced from 35.62 per cent in 1978-79 to 29.11 per cent in 1992-93. The use of logs, concomittantly, had increased dramatically from 18.95 per cent to 32.49 per cent. The study also effectively undercut the alarmist tones of studies that had shrilly talked about a huge rural energy crisis in the 1970s and 1980s, and linked it to a 'disappearing forests' thesis. If higher quality logs were being used by the early 1990s, it meant that the crisis had passed. In fact, it meant that a whole lot of wood was now available from sources other than the forest. It was clear that people were using, not so much the forest, but other sources to collect their fuelwood from. What were these sources? Trees grown on self-owned farmlands, or plantations. One major factor for the transition from non-fuelwood biomass fuels to fuelwood, and from inferior to superior fuelwood, was the success of the farm forestry initiated in the 1980s by state forest departments, as part of what was then called the social forestry programme. Farmers planted high yielding trees in their lands for commercial purpose. The initial market was for the construction business. As this market saturated, farmers started selling it to the paper and pulp industry. But in the mid-1980s, the government reduced import duties for wood pulp and farmers lost even the pulp market. The only way out was to sell it as fuelwood. According to the 1995 ncaer survey, 48.50 per cent of the total fuelwood requirement was sourced from self-owned farmlands. The use of forests was down from 35. 42 per cent in 1978-79 to only 17 per cent. This was, no doubt, due to legislations brought in by state governments banning felling of trees in forests. Researchers now conclude that only 30 per cent of fuelwood is sourced from government forest. Forests occupy less than 20 per cent of India's landmass; assuming an evenly distributed population, the total fuelwood requirement of the country might also be in the same proportion. Another indicator that forests aren't really ravaged by headloaders is the stable price of fuelwood. At a national workshop on 'Woodfuel Trade in India', organised by the iifm and the Indira Gandhi National Forest Academy (ignfa) in Bhopal in February 1999, experts observed that the price of fuelwood stabilized during the 1980s. The Labour Bureau in Shimla, Himachal Pradesh, which monitors fuelwood prices in India, reports that fuelwood prices in some of the major towns of India remained almost constant during 1985-90. Headloaders are no environmental villains. Phulmai is one of millions keeping alive the biomass economy. The tragic irony is that the biomass economy hardly keeps her alive. Headloading is, first and foremost, the effect of a shift in survival strategy. It rides on the back of increasing difficulties small farmers face in ekeing out an existence. Ploughing up enough yield today requires many more inputs: fertilisers, pesticides and irrigation. With low landholding, it becomes an expensive proposition. The share of muscle power in agriculture has decreased from 98 per cent in 1950-51 to 20 per cent in 1995-96; 63 per cent of India's population dependent on agriculture now need to supplement their earning from other sources. Phulo and Kishna started headloading under such circumstances. "One way all sources have dried up due to ecological imbalance in village. For this cash-deficient population headloading immediately becomes a lucrative option of survival as it is a zero-cost business," says N C Saxena, former secretary, Planning Commission. Attempts to curb fuelwood collection invariably leads to more human misery. Madhu Sarin, a Chandigarh-based forestry expert, reports of a survey done in 45 villages in Churchu, Mandu and Sadar blocks of Hazaribagh district. About 19,000 tribal women -- their nearby forest closed for protection and forced to use leaves, lantana and dung as cooking fuel in lieu of headloading -- began brewing alcohol for sale, or worked in brick kilns on exploitative terms or as unskilled manual labourers. A study of 20 village forest protection and management samitis in Santhal Pargana in Jharkhand found that forest protection in most of them had collapsed within a year of their being set-up. In all the cases, women headloaders had the same question, "What shall we eat?" Forest officials in West Bengal faced the same question when they approached women for participation in jfm. For the 600 households of the Arbari pilot project in West Bengal, on which India's jfm programme is modelled, the forest department spent about Rs 100,000 annually for many years on generating alternative wage employment for poorer villagers to compensate them for money they used to earn headloading and had now forsaken. The fact is, government has always seen the fuelwood question from a conservationist lens. But, as Shukla, puts it, "There is no escape from biomass in India." Therefore government could change its current blinkered vision and recognise trade in fuelwood as a legitimate forestry activity. It uses the lure of fuelwood for community participation in jfm in any case. Couldn't it widen the net? In the same spirit, it has to abandon its campaign to substitute wood as an energy source. The only alternative to wood scarcity is to produce more wood. That would ensure energy security at the village level, and attain the government dream of placing one-third of India's land area under green cover. The wood energy sector could become the nerve-centre of overall rural development. "I don't find any problem in encouraging fuelwood collection and its use. It will enhance the rural economy," says iifm's P Bhattacharya. Similarly R C Trivedi, the regional conservator of forest, Jharkhand, says, "By curbing fuelwood extraction we will be incurring heavy indirect loss as people will run away from forest conservation. Rather recognise it as the most sustainable village economy." Could not poverty alleviation programmes have a fuelwood component? It might change the status of headloading from a crisis-driven occupation to an organised one. Let us remember here that wood is renewable energy. India runs the world's largest renewable energy programme with technology to use biomass to generate energy. This application can sustain a large quantity of wood. Wood plantations have many advantages: besides fuel, they provide timber for homes and village industries and help to regenerate the soil. And there is enough land for fresh wood plantation. Both private and public degraded land could sustain wood crops. Since poor farmers own a lot of these degraded private lands, it would also be a useful anti-poverty strategy. There are about 26.7 million hectares of degraded lands. If firewood farming develops as a business, it should be possible to grow commercially viable firplantations in these areas. Saxena suggests that public land should be used more for taking up plantation and be managed by the community or the present population dealing with fuelwood. The fuelwood sector could organised on the pattern of the dairy sector. Institutions could be developed within the village to provide a means for marketing in the form of co-operatives. These bodies can act as the channel to the market. They could regulate fuelwood supply so that the product gets markets. The supply could be adjusted such that fuelwood produced in one area can be supplied to those areas where demand is high but supply is low. Anil Agarwal, founder-director of Delhi-based Centre for Science and Environment, had suggested that this demand for wood should be used as an opportunity to grow more trees and to use them for different applications. "One could think in terms of small 5-10 mw power plants for power generation. Biomass gasification could also be thought of. If tree planting was encouraged in rural areas and the wood was used for energy purposes, the Government of India could also think of reducing its subsidies on kerosene and lpg," he said. It is perhaps necessary, today, that headloaders such as Phulmai walk in oblivion. But it isn't sufficient. Will the future make them visible, not as metaphors to be assembled from a jumble of facts and figures, but as human beings able to live a respectable life?